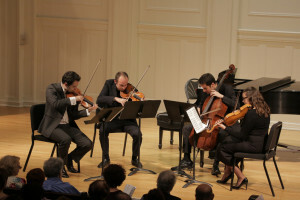 Acclaimed violinist, David Lisker, a Juilliard graduate and former student of legendary violinists Itzhak Perlman and Pinchas Zukerman, is presenting an unforgettable event celebrating the lives and music of 6 Jewish composers directly affected by the Holocaust, 5 of whom perished in the concentration camps. David and 4 other acclaimed young musicians from New York will perform an array of works by these inspiring individuals who, if had been allowed to realize their potential, might have entirely changed the course of music in the 20th century. The program, performed by violinists David Lisker and Regi Papa, violist Jay Yiu, cellist Michael Katz, and pianist Renana Gutman, will feature the Piano Trio by Mieczyslaw Weinberg, selections from string quartets by Erwin Schulhoff, movements from string trios by Hans Krasa and Gideon Klein, the first movement of Piano Sonata no. 7 by Viktor Ullmann, the only surviving composition by Robert Dauber, as well as beloved works by Joseph Achron and Ernest Bloch.